Robert John Drayton, 96, formerly of Crystal Lake, died at 1:00 a.m. on Saturday, December 1, at Meadowbrook Health Center in Urbana. Bob Drayton was born January 31, 1922 in Sycamore, IL., the son of Horace Drayton and Fannie (Rasmussen) Drayton. Bob Drayton is survived by his four children: John Drayton of Decatur, Janet O’Connell of Lombard, Susan Spangler of San Diego, and Thomas Drayton of Burlington, WI. He is also survived by a sister, Joyce Eggleson of Stoughton, WI, as well as 8 grandchildren: Laura (Drayton) Bowman, James Drayton, Robert Richard Spangler, Michael Robert O’Connell, Christine (O’Connell) Smalley, Nicole (Drayton) Purdom Beebe, Maggie (Drayton) Wilt, Molly Ann (Drayton) Clark, and many great-grandchildren. He was preceded in death by his wife of 64 years, Ruth Drayton, who died in 2007, and his younger brother, Gordon Drayton, of Florida. 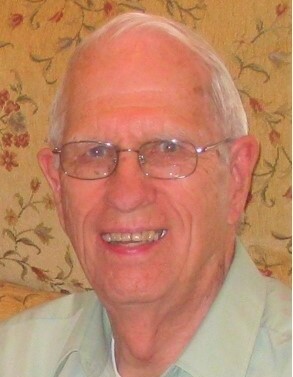 Bob Drayton was a graduate of Sycamore High School and attended the University of Illinois. He married Ruth Jeanette Whitson in 1942. He graduated with a degree in architecture from the University of Illinois in 1947. During World War II he served in the Signal Corps. After the war he started his architectural practice in Illinois, Wisconsin, and Michigan working for other firms. In 1965, he opened his own practice in Crystal Lake with his partner Fred Lindsay. Together they designed small factories, municipal buildings, schools and churches. In 1994 he and Ruth moved to Clark Lindsey Village where they spent many years as active leaders. Over the years, he was the head of the Residents Council, the Buildings and Grounds Committee, the Outdoor Recreation Committee and the Committee to Revise the Residency Contracts. They had many good friends at Clark Lindsey over their 24 years in residence. Memorial services will be held Saturday, December 8, at 11:00 AM in the Dining Room at Clark Lindsey Village, Urbana. Private burial will be held at St. Mary’s Episcopal Church Courtyard, Crystal Lake. Cards and letters may be sent in care of his daughter, Janet O’Connell, 58 N. West Road, Lombard, IL 60148. In lieu of flowers contributions can be sent to Meadowbrook Health Center at Clark Lindsey Village.